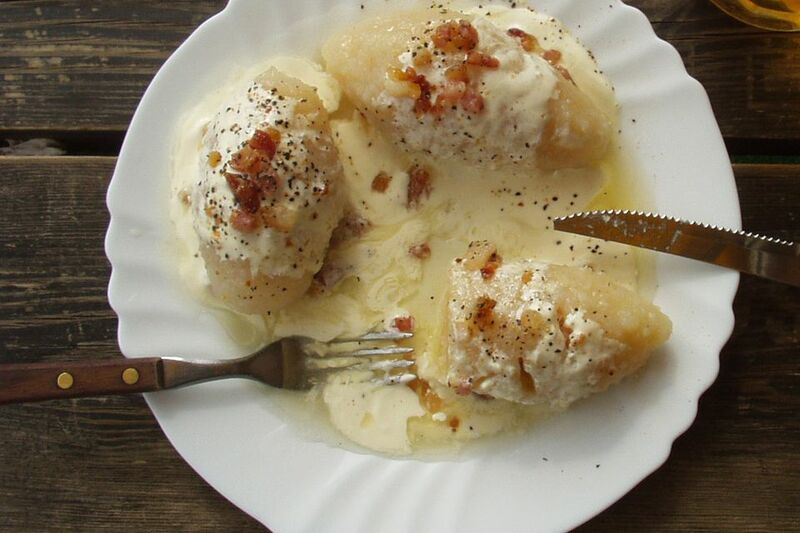 Lithuanian potato-meat dumplings are known as zeppelins or cepelinai because of their shape. These are hearty and rich. Don't be intimidated by the recipe. While they do take some time to make, they are well worth the effort. This recipe has a few steps in order to make each component of the recipe, including the filling, the dumpling, and the gravy. Also note, you need to prepare the potatoes two ways: peeled and grated and then peeled, boiled and riced. You'll likely want to use a potato ricer for that step. Use your favorite ground meat combination for the recipe. You can use all ground pork or a meatloaf style mixture of pork, beef, and veal. If you don't eat meat, you could make another variety of dumplings that are potato-cheese cepelina. This dish is best served and eaten as soon as it is made. The dumplings are hard to store and are best piping hot and covered with hot gravy. In a large bowl, mix together ground meat, finely chopped onion, 1 teaspoon salt, pepper, and egg until well incorporated. Cover with plastic wrap and refrigerate until ready to use. Add a drop or two of lemon juice to the grated potatoes so they don't turn brown. Place them in a fine-mesh cheesecloth or cotton dish towel and twist over a large bowl to get rid of the excess water. Pour off the water, reserving the potato starch at the bottom of the bowl. Unwrap the cheesecloth and place potatoes in the bowl with the potato starch you reserved from the bottom of the bowl. Add the riced boiled potatoes, grated onion, and 1 teaspoon salt or to taste. Mix well. Put a large stockpot of water on to boil. To form the zeppelins, take about 1 cup of dumpling mixture and pat it flat in the palm of the hand. Place 1/4 cup or more of meat mixture in the center and, using slightly dampened hands, fold the potato mixture around the meat into a football shape, sealing well. Continue until both mixtures are gone. Carefully lower dumplings into salted, boiling water to which 1 tablespoon of cornstarch has been added (to prevent dumplings from falling apart). Make sure water returns to the boil and continue boiling for 25 minutes. Remove dumplings with a slotted spoon or strainer, drain briefly on a clean dish towel and place on a heated platter. While the dumplings are boiling, make the gravy. In a medium skillet, fry the bacon and chopped onion until tender. Drain and combine with sour cream and black pepper. Thin with 1 to 2 tablespoons milk if necessary. Ladle dumplings with gravy or pass the gravy at the table.